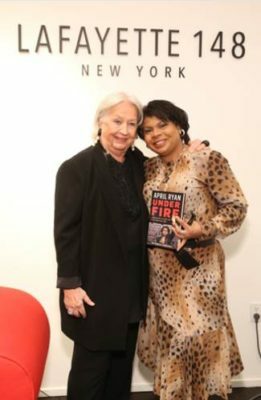 April Ryan stopped by her favorite design house Lafayette 148 New York’s Soho store on Saturday, September 13th for a launch event for her new book, Under Fire: Reporting from the Front Lines of the Trump White House. CNN’s Brooke Baldwin was on hand to interview Ryan about the book and her experiences in the White House briefing room. Ryan has been called the most fearless White House correspondent in the Trump era, and she looked the part in a Lafayette 148 New York agave leopard silk dress. Notables in attendance included Broadway’s James Monroe Iglehart, Gavin Gregory, Carla Stewart, and Lafayette’s Chief Creative Officer Barbara Gast.